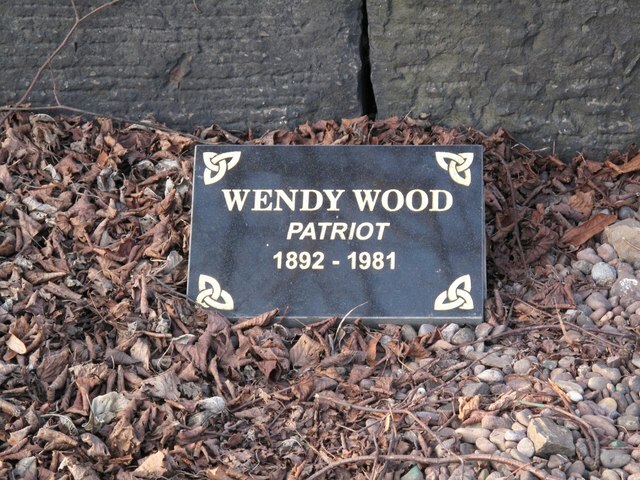 A firebrand figure from Scotland’s recent past, Wendy Wood (born Gwendoline Meacham), artist, poet & writer, was a passionate Scottish Nationalist and activist for her whole life. Born in Kent in 1892 as her parents were in the process of emigrating from Scotland to South Africa, Wendy spent her early years learning and growing in a tough environment. A child during the Second Boer War, many of her earliest memories were coloured by her mother’s work in nursing the wounded and the violence and noise of nearby warfare. After the war, Wendy was given a huge amount of freedom to roam and get up to misadventures with her younger brother, whom she had been asked to be a brother to. This was brought to an end when, after organising strikes and frequently being sent home from school for outspoken behaviour, Wendy was sent to an all girl’s private school in Tumbridge Wells. Upon leaving school, she decided to train as an artist, following in the footsteps of her grandfather, Samuel Peploe Wood. Though not even 15 years old, she joined an artist’s studio in Chelsea, studying under Walter Sickert and lived in a women’s hostel run by nuns. At this point in her life, influenced by her older sister, Wendy met with a number of London’s pre-war Literati, including WB Yeats and George Bernard Shaw. But Wendy put aside her dreams of being an artist when she married at the age of 19. In 1913 she toured the Highlands with her husband, culminating in a visit to the Wallace Monument in Stirling which was to have a lasting effect on Wendy. From their she went on to join the Scottish League in 1916, the Home Rule Association in 1918, the Scottish National Movement and, ultimately, helped to form the National Party of Scotland in 1928. A deeply committed activist, Wendy regularly went on speaking tours around Scotland to drum up support for Home Rule. These were not neatly arranged and tidily organised tours, these were tours that required spirit and gumption, neither a quality that Wendy lacked. Taking a van, a handful of activists and some camping gear, they would roam the country, stopping in villages and towns along the way to hold ad-hoc public meetings. Many nights were spent under the stars at all times of the year and every kind of weather Scotland could throw at them. It was on these tours that Wendy honed her firebrand style of speaking which later led her to all kinds of trouble. 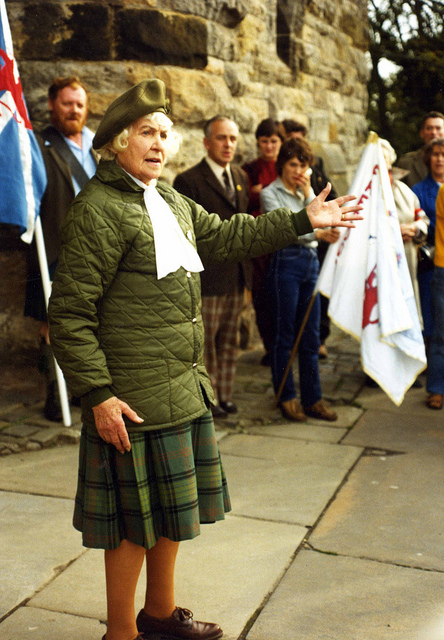 During the annual Bannockburn Rally in Stirling, in 1932, Wendy led a group of Nationalists up to the Castle, where they pulled down the Union Flag and replaced it with a Lion Rampant. Wendy stood on the Union Flag accidentally during the excitement and it was torn. She did not, as Eric Linklater alleged, flush the flag down the toilet, so she sued him for defamation. The Union Flag was recovered and raised again over the castle. She was arrested and imprisoned several times during her long life, all for activities connected with her Nationalism. Her first experience was at Saughton in Edinburgh after being arrested for disrupting a rally being held at the mound by fascist Black Shirts. Her second spell in prison at Duke Street in Glasgow was prompted by her desire to observe the appalling conditions there for herself. Realising that she was most likely to be jailed for Nationalist activity, she undertook a protest of non payment of National Insurance, whose headquarters had been moved from Edinburgh to Cardiff. When on trial, the judge was apparently most bemused by her enthusiasm for a custodial sentence, particularly as he pointed out to her she wasn’t really earning enough to qualify for payment. Duly sentenced none the less, Wendy spent several frigid and dreadful weeks at the prison, discovering for herself the dreadful conditions. Afterwards she lobbied the authorities mercilessly until Duke Street was finally closed. Her final spell in prison was at Holloway, where she was sent after being convicted of inciting a crowd of Scotland fans in Trafalgar Square on the day of a Scotland v England game in 1951. She was beaten by policemen during her arrest and began her sentence in the prison hospital. A well known nationalist, she had been under some suspicion the year before when the Stone of Destiny was stolen from Westminster Abbey. Because of this, she took a lot of abuse during her time at Holloway. She had an often fraught relationship with the SNP, resulting in her leaving the party on several occasions. One of these instances was when she stood as an Independent for the Glasgow Bridgeton constituency.